MY Yoke is Heavy! – Journey of Emotions! Weight! So much gravity to responsibility. My teens and their life, literally, and future, their character and growth. My husband’s relief and support and this thing called marriage. The women and young ladies I serve who ache, are lost, hopeless or even simply eager to learn. The angst of my friends who battle giants. My own character development and faith walk. The hands on the street stretched out while the other holds a cardboard sign. Money, possibly, the heftiest of all burdens for many. I work, more hours than I rest, put have no income. Short list not all inclusive. A lightened load I seek. God says, “then lay down what I never asked you to carry. I ask that you become like Me, not that you are Me. I lay, at His feet, my children for He loves them deeper and knows their design more intimately than I.
I intertwine my marriage into a three-strand braid with Christ and become wrapped in a love that I alone could never give. The women I serve look not to me, but to where I point, which is the direction of Hope, Love. My friends are lifted by my prayers more effectively than by my strength. The ones on the street don’t seek saving, but a Savior. Money, well, it’s all his anyway and you can’t take it with you. All these things are things I care for but am not responsible for their change or growth or salvation. That’s God’s job. Mine is only to emulate the character of the One who can. Now Christ’s word, “Come to me all who are weary and heavy burdened, and I will give you rest,” makes sense. 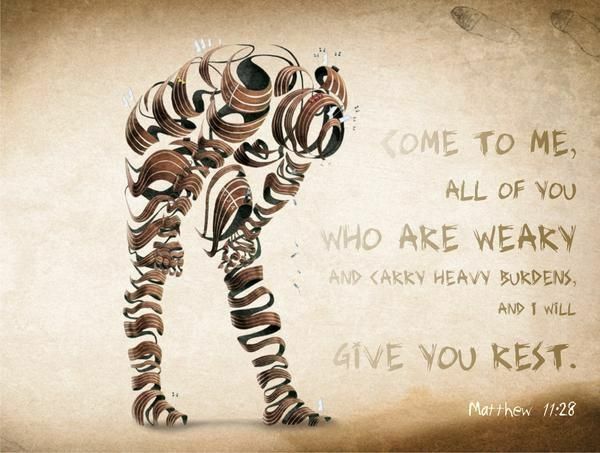 MY burdens are heavy, His are not. For when I do this, I am more equipped and able to reveal who He is to others, so that He can do His work in them.